With modern fast paced lifestyles and busy schedules, we are more and more looking for authentic and functional products that can help us maintain our health and wellbeing while getting maximum out of the day. One of the big areas of people’s focus recently has become the gut health. Indeed, our gastrointestinal tracts work hard to keep us healthy and happy. And when gut health is compromised, we can face major health consequences. We have all heard of probiotics – a live friendly bacteria – which has proven to deliver lots of benefits for digestion and as a result – to the body, mind and mood. The go-to product when it comes to probiotics is yoghurt, however not everyone knows that the world of probiotics is much more diverse and exciting. 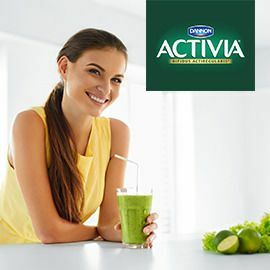 Our sponsor, Activia – a world-famous brand – is launching a series of four contests to create new innovative products to help people take care of their bellies. This third contest is all about the power of nature and fermentation that gives us the rich choice of organic probiotic solutions for people with different diets and lifestyles. Invent a next generation of fermented food and drink products that will go beyond the existing dairy and plant-based probiotic solutions. Format: Visual and text description. See Easy Submission Form. Participate before March 04, 2018 23:59 UTC!